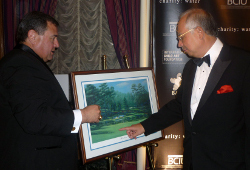 The Honorable Dato Sri Mohd Najib Bin Tun Abdul Razak, Prime Minister of Malaysia, was presented with an artist’s proof of a classic sports painting “Twelfth at Augusta,” at a special dinner in New York City Friday, 16 April. United States Sports Academy Vice President Dr. T.J. Rosandich made the presentation. The painting is the work of 1985 American Sport Art Museum and Archives (ASAMA) Sport Artist of the Year Donald Moss. The piece depicts the most famous hole at the Augusta Country Club in Augusta, Ga., the club that hosts the Master’s Tournament. It was presented during a dinner the Business Council for International Understanding (BCIU) and the Academy hosted for the Prime Minister and First Lady of Malaysia at the Regis Hotel. Moss’ paintings are featured in The Best of Sports Illustrated, many museums, and the baseball, basketball, and tennis halls of fame as well as United States Golf Association’s Golf House. He was invited to the White House by President Ronald Reagan for the opening of the Smithsonian’s “Champions of American Sport Exhibition,” which featured his paintings of Ted Williams and Jack Nicklaus. The work was one of three ASAMA Sport Artist of the Year winners’ pieces that were presented that weekend. Sculptor Sergey Eylanbekov, the 2004 Sport Artist of the Year, created the sculpture used for the inaugural BCIU International Peace and Harmony Award, which was presented to Malaysia’s First Lady, Her Excellency Datin Paduka Seri Rosmah Mansor. Bruce Larsen, the found object artist from Fairhope and 2009 Sport Artist of the Year, designed a sculpture of a dancer that was presented to Datin Seri Rosmah, who is an accomplished vocalist in Malaysia as well as a very active First Lady. Two Sports Artists of the Year were present at the dinner. Along with Eylanbekov, current Sport Artist of the Year TAFA was present and he joined the Malaysian Prime Minister and First Lady in a rendition of the 1985 fundraising song “We Are The World” on stage at the gala.